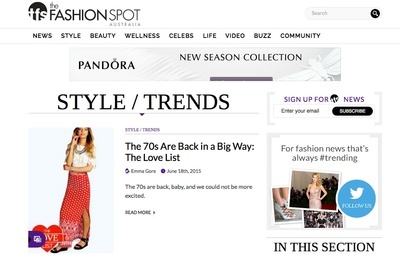 America's first-ever online community of designers, stylists, and industry professionals fashionspot.com.au has reached Australian shores, with a new fashion focused site dedicated to an Aussie audience. The Fashion Spot, a stem of Evolve Media LLC's umbrella, introduces an online community dedicated to women’s interest and family lifestyle, which falls under the TotallyHer division. The Fashion Spot has already; published extensive content exploring this year's Mercedes-Benz Fashion Week Australia, conducted interviews with the judges for this year's Australia’s Next Top Model and covered Sydney's premiere of Mad Max: Fury Road. Forthcoming content will explore some of the fashion industry's most interesting and thought provoking issues, and will document each season's collections and trends, shopping ideas, tutorials, celebrity fashion and more. The Fashion Spot's Australian editor, Chantelle Schmidt, said: “The launch of the site in Australia allows us to combine our global expertise and resources with a local editorial voice and deep understanding of the local market." Check out fashionspot.com.au for your one-stop fashion stop covering all the latest runway shows, celebrity and beauty trends, plus fashion tips for every budget.